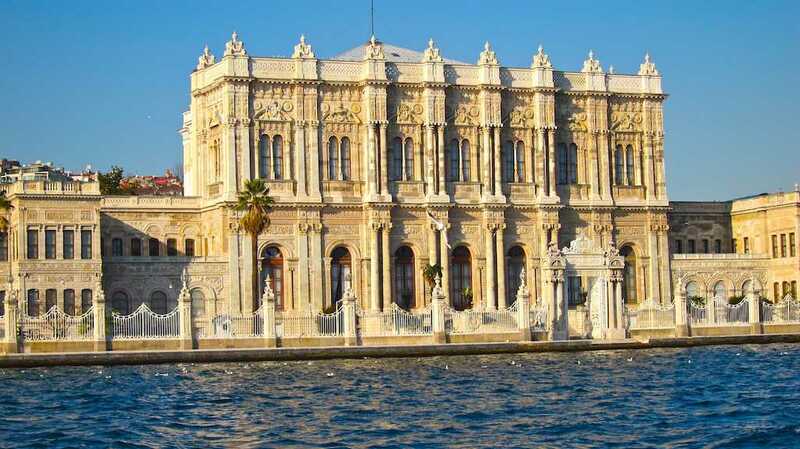 Dolmabahçe Palace was built by famous architect Armenian Garbert Amira Balya, at sultan Abdulmecid’s request in between (1848-1856) years. It is located in between Besiktas and Kabatas, the districts of Istanbul. 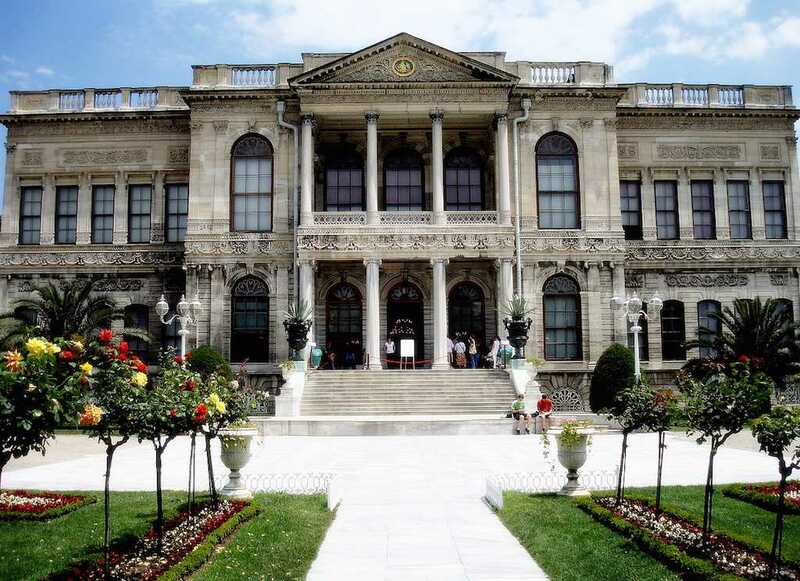 Ottoman Sultans have many palaces in all ages and their center, main palace was Topkapı Palace because sultan Abdulmecid preferred a more modern place. 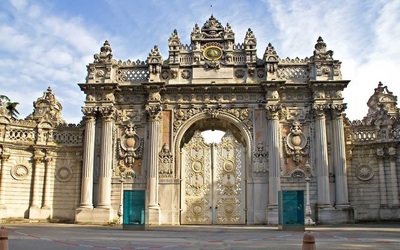 However Topkapı Palace was abandoned after the completion of Dolmabahçe Palace. 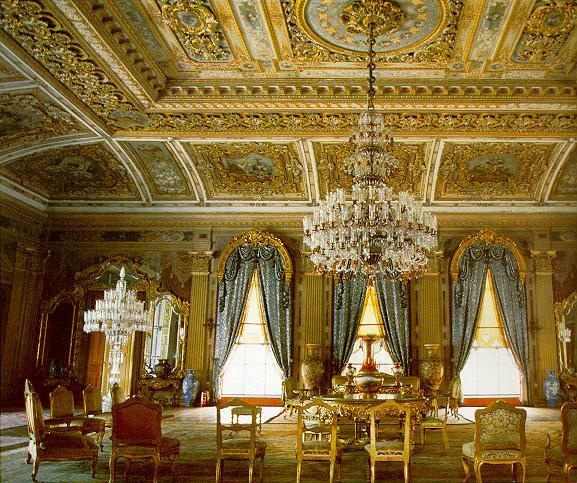 It was the imperial place of all following Ottoman Sultans, with the exception of Abdülhamid II (1876-1909) who preferred living in the more lonely Yıldız Palace. An apartment within it served as Atatürk's residence in Istanbul and he died there on 10 November 1938. 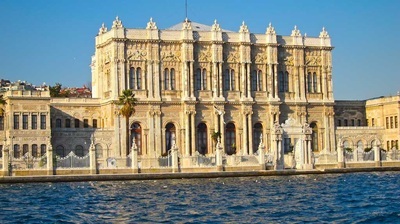 Dolmabahçe Palace has 3 floors, symmetrical planned. There are 285 rooms and 43 halls. The exterior walls of the palace was made from the limestone and its roof was covered with the bullet. The entrance of the palace was used as administration of state. Within this section sultan met the citizens with official business and his guests. The rooms and the baths were decorated with the different colors marbles and the interior and the exterior sections of the palace were adorned with many different flowers. Especially, the interior adornments were created by French and Italian artists but the decoration belonged to the French artist M.Sechan. 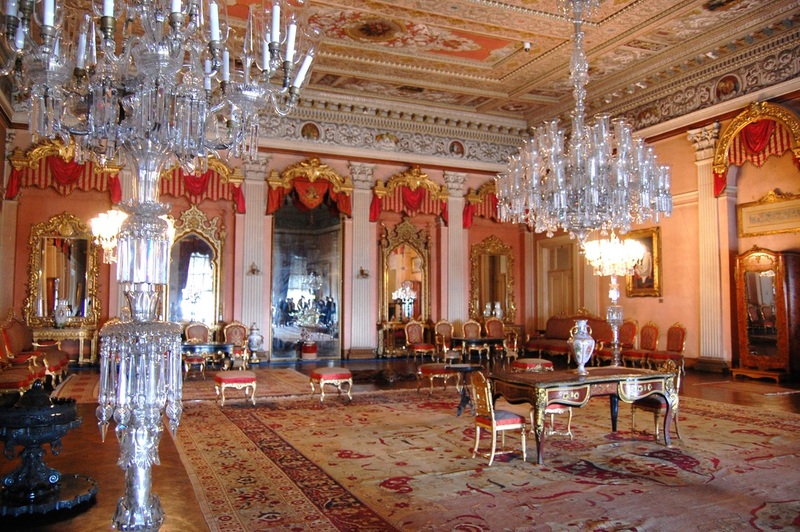 Therefore, the interior section of the palace reminds of the Versaile, the French Palace. 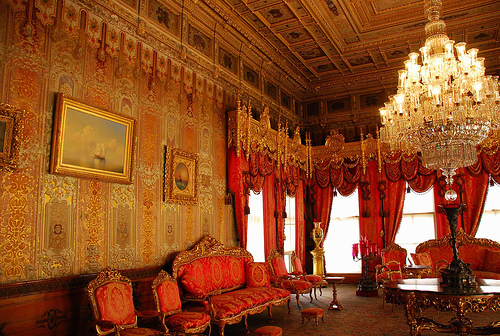 Because of these features, Dolmabahçe Palace shows the influence of the West on the Ottoman Empire. 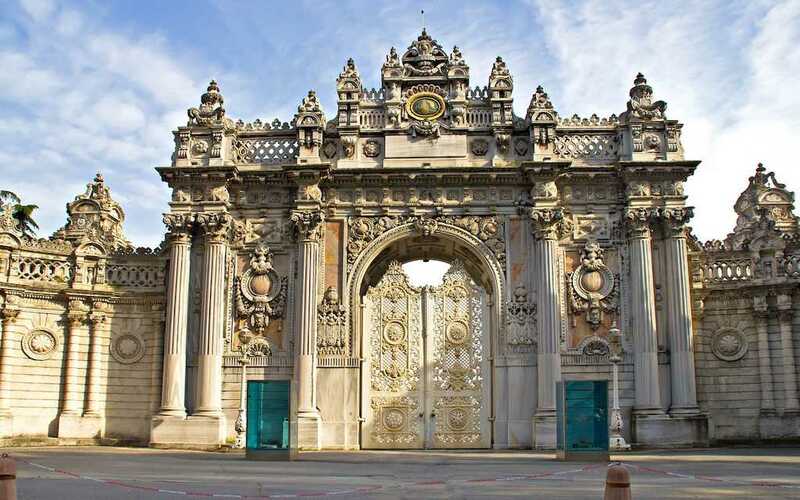 The tallest and most majestic hall of Dolmabahçe Palace is located between Harem and Mabeyn Muayede. Actually the main building of the palace divided into three parts; respectively names are Harem, Mabeyn Muayede and Harem-I Humayun. Blue hall well known as the ceremonial hall was a place that sultan met the public. It ıs situated in the center of the Sultan’s harem. It is named as Blue to be used blue colors ornaments, decorations and marbles within this part. This room takes its name from the intense red color decorations, designs and ornaments. Its walls are covered with the fabric and ıts ceiling is designed dome-shaped. 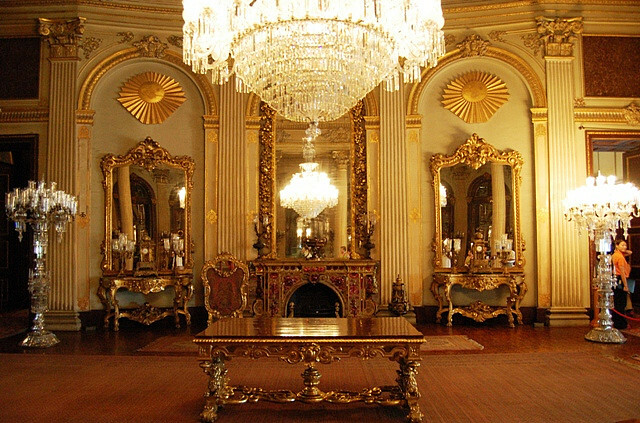 Gold leaf doors, red crystal chandeliers, world map motifs are also located in this room. 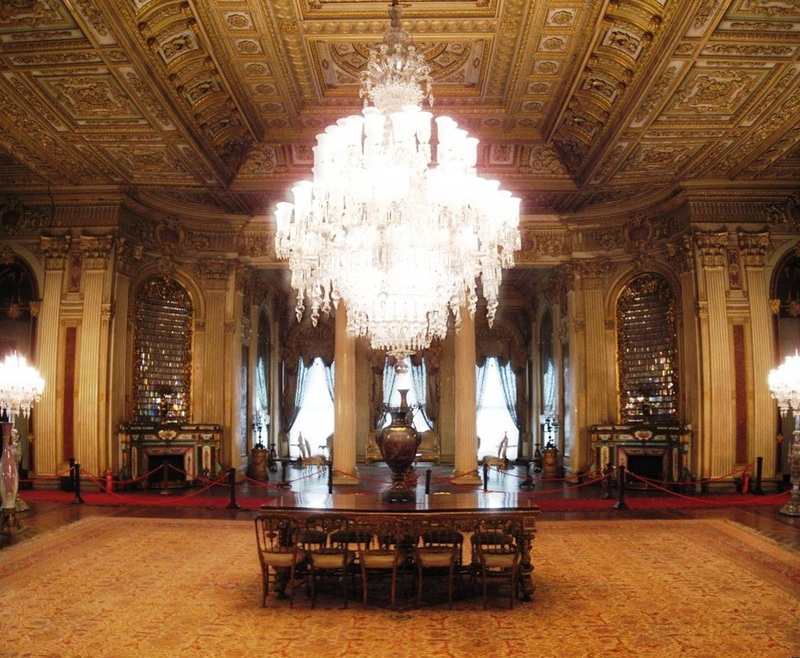 That perfect hall is one of the most luxurious place in the palace. It has a splendid decoration and has symmetrical decoration feature. Especially The foreign guests were welcomed in this place.It is also called Ambassador Hall. Zulvecheyn hall means two sided to establish connection between interior and exterior departments. It was a place where was made preaching ceremony, wedding ceremony, another rituals and important events. 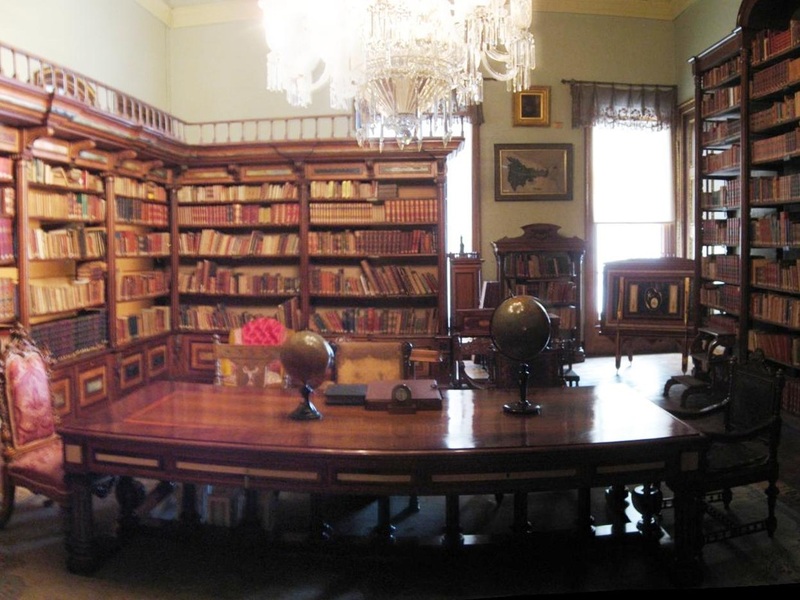 The library of Dolmabahçe Palace includes many different books belonging to the Ottoman period, Ataturk (the first president of the republic and a hero of Turkey) and Inönü (the second president of republic) time. The rich library was built by Sultan Abdulmecid II.